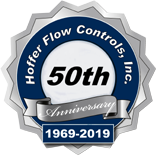 Hoffer Flow Controls has been supplying turbine flowmeters to the automobile drag race world for the past several years. Typically a small HO Series flowmeter with a magnetic pick up coil is supplied to meter a nitro-methane fuel mixture on the supply side of the engine. This allows the driver to accurately monitor consumption during the race. The flowmeter monitors both flow rate and total. This allows the car crew team to evaluate how much fuel was used during the race. This is critical information in drag racing. A typical race is a ¼ mile and is completed in under 5 seconds. 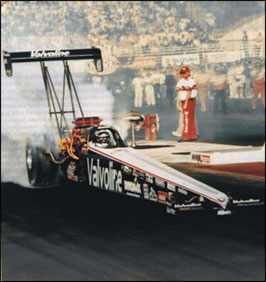 Approximately 5 gallons of fuel are used during the race and the dragster is moving at in excess of 300 miles per hour at the end of the race. The fuel consumption information is used to evaluate future car design changes. Hoffer has been selected as the supplier of flowmeters by a number of race teams and car design teams. A critical issue in the selection of a flowmeter is accuracy, response time, and low pressure drop. The Hoffer HO precision series flow meters are supplied with 100% of the meter components precision machined. No “cast” components are used. The low mass rotor responds in 5 to 7 milliseconds. An additional consideration was the pressure drop created by the meter. The Hoffer design provides a shallower blade angle than other turbine designs. This minimizes the pressure drop. The typical pressure drop on these meters is about 4 to 5 PSI at full scale. This is about half of what other turbine designs exhibit. The combination of “winning features” on the Hoffer HO series of axial turbine flowmeters provide the maximum number of benefits to the race car world. This application adds a new dimension to auto racing. The winner in today’s race world is a combination of a talented driver and a car with the best design and instrumentation available.